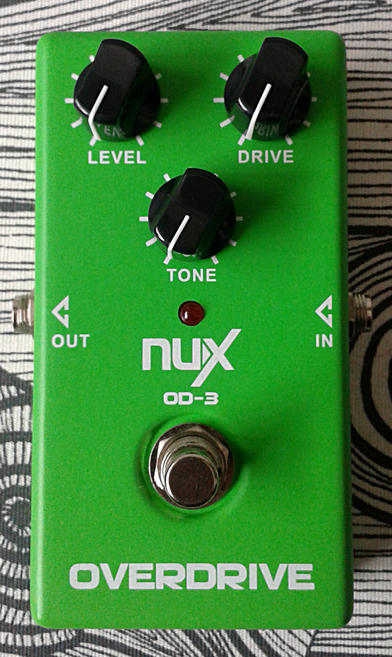 Nux OD-3 Overdrive. Super cheap thing, made in china 2013. 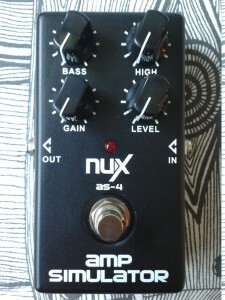 The next one of the Nux analog series box to arrive. As usual, i opened the box, tried it out and ripped it open to take a few (poor) photos. 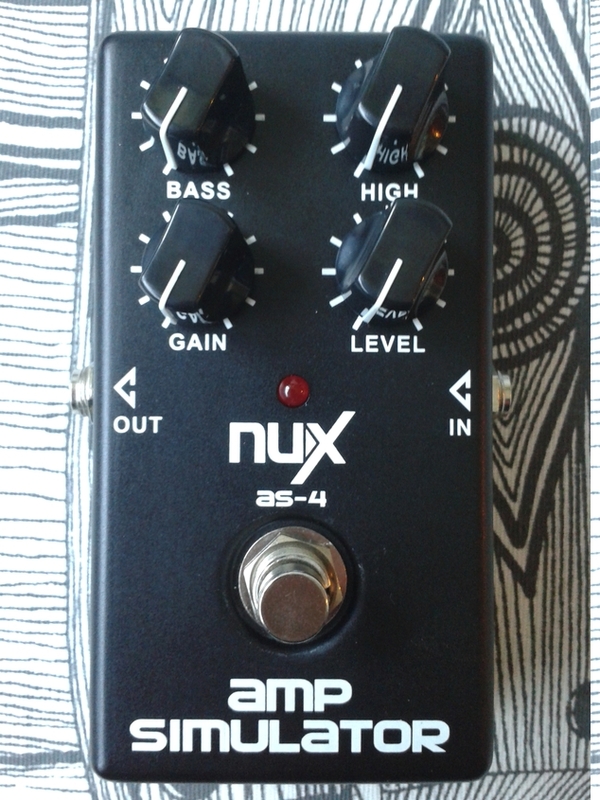 Short testing convinced me that this is nothing more than Yet Another Tube Screamer (TM). 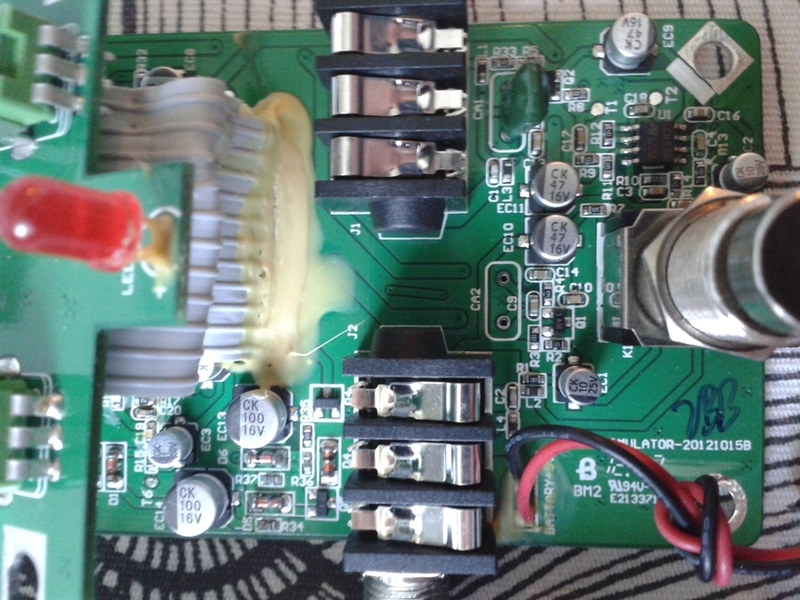 Some flux residue. 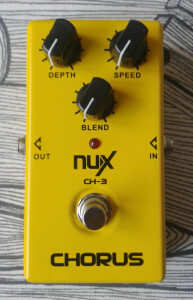 The box design is the same as in all the others in Nux’s analog series. The pot feel is as terrible as in others too. The pot tapers and values look familiar. Still, a reasonable build quality with solid design choices. True bypassed basic pedal. I really just wish they would do something about the pots. I don’t think the better ones with sturdier feel ans more solid build quality would have cost that many cents more per piece. 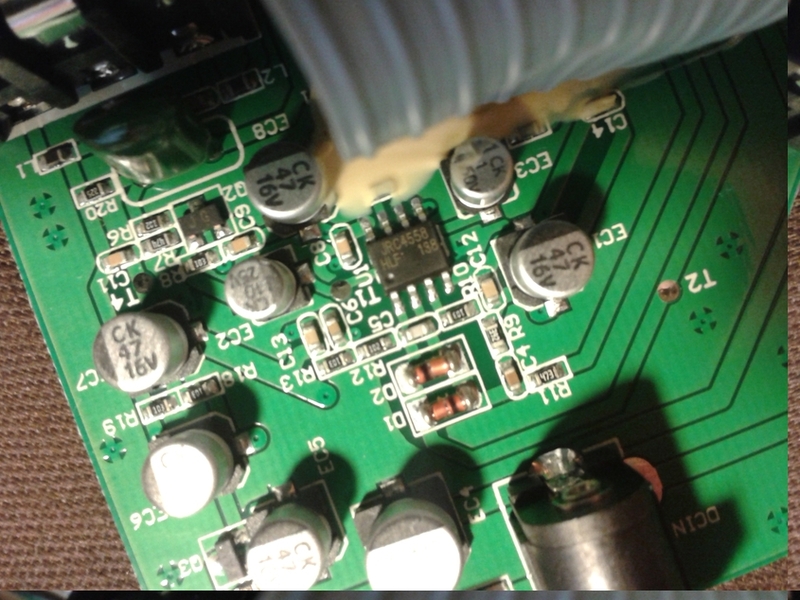 Exactly like every tubescreamer and derivative around (mid-honk, lowish output etc.). Not much more to say. Exact circuit copy will sound like the original. No surprises there. Cheap and built with reasonable quality. 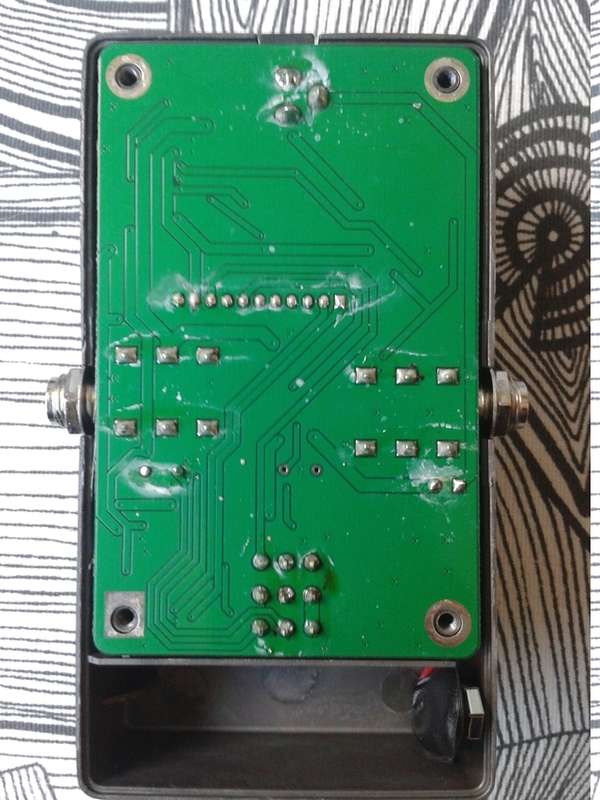 Might be a nice option for anyone looking for a cheap TS with a true bypass. 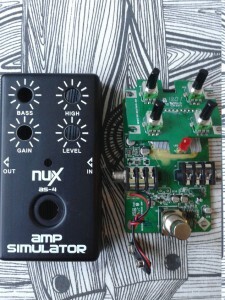 Nux AS-4 Amp Simulator from Nux New Analog series. Made in china in 2013. Cheapest thing there is. These units have around for some time now, and this unit is part of family of four. 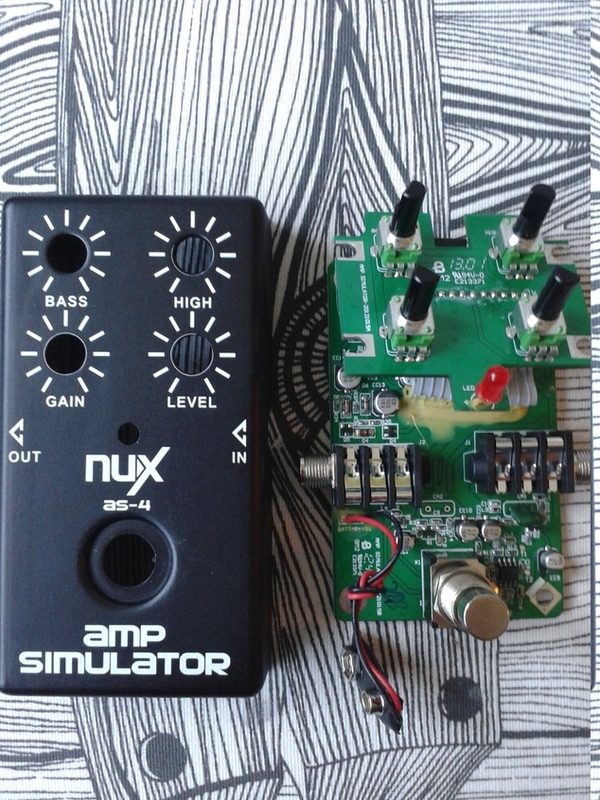 There is Overdrive, Chorus, High gain distortion and this one – The Amp Simulator. The price tags raised a few questions. Could it be usable or just crap in design and build quality? Is it one of those cheap 1:1 corporate clones that flood the market from china? I wanted to find out, so regardless of the risk, i bought this one. Of course, i ripped it wide open as soon as it landed on my mailbox. As the japanese started to use two separate boards in the beginning of the 80s, we have the same board method utilized here. The biggest difference being the 1590B-sized box instead of higher type commonly used by Boss and others. 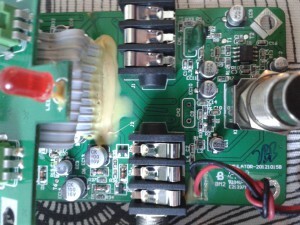 The bigger board has the effect circuit and switching, while the smaller board holds only the controls. Standard true bypassed pedal with “meh” build quality. Some ugly flux residue, but the components are baked on neatly. The design methods are not bad at all. The screws that seal up the bottom plate are also used for fastening the bigger bottom board to the enclosure. 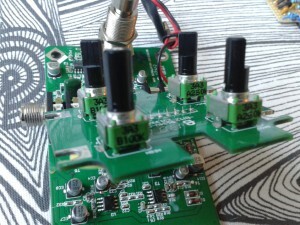 If you’re going to build pedals in huge mass produced fashion, this is the way to do it. 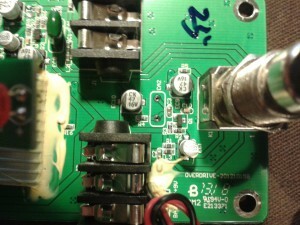 the jacks are screwed on to the box as well, offering some more sturdiness. The engineer behind the box design knows his stuff. Next up is the one biggest issue i’ve come across. The pots. 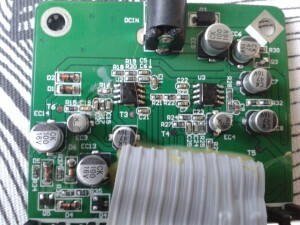 While those may be 1:1 clones of Alpha brand components, they are not good. One big culprit on the whole pedal. They work – yes. But they turn way too easily – in a word, they are just too sensitive. Just a tap with your foot can ruin your perfectly tuned settings in a heartbeat. If the company didn’t “save” money on pots, i would strongly recommend these for anyone and everyone. It is quite sad. One little thing ruins a design that is otherwise reasonably good. Didn’t go too deep on to what the design has in store. I’m just going to leave it by saying that the component selection reminds me of Xotic’s BB preamp pedal. I’m also hoping that Nux won’t sell these things as OEM for cheapo brand boxes for their own good. 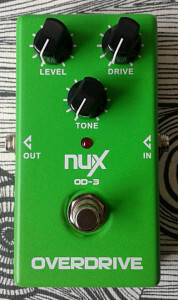 So far i’m quite confident that the future of original chinese pedals lie within Nux. Nux CH-3 Chorus from Nux’s analog pedal series. Made in china, 2013. 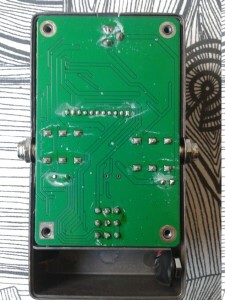 There is something appealing in these super cheap new chinese pedals. I have no idea whatsoever what is the amount manufactured, but these are mostly well made and fine sounding boxes. I’m fairly convinced that china will be new japan in decade or two. After all, the japanese electronics were considered crap all the way up to mid 80’s. 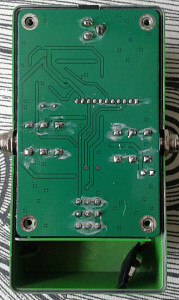 What chinese pedal industry would need now is tighter quality control for components and a few good graphic designers. Most Joyos and Calines with horrible graphics you can find on ebay are now even pricier than when they were first introduced. There’s not much appeal in those. At least not for me. So it’s good that we finally have a chinese brands that try. No comic sans as labels and Nux’s even have their own, reasonably stylish logo. Opening the box up shows the Nux standard designs idea. 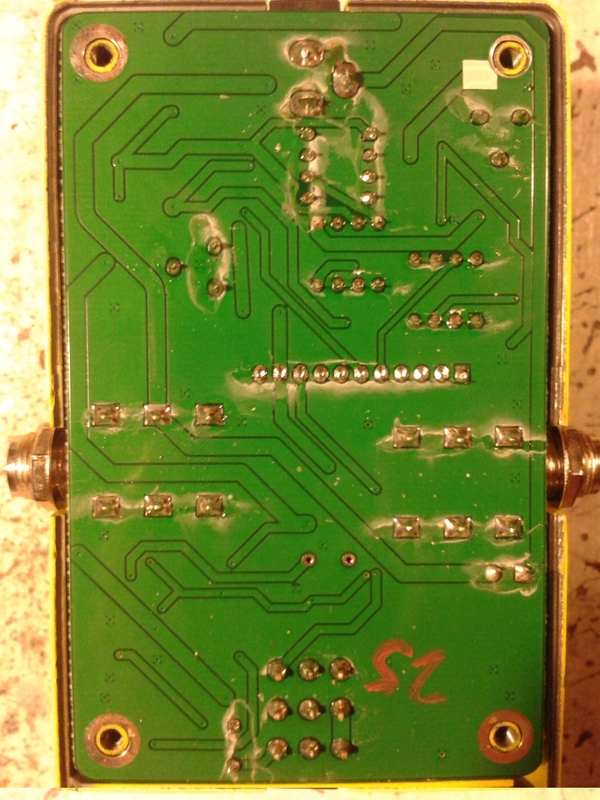 Two boards stacked and through hole components seem to have solid connections, but with residue as usual. 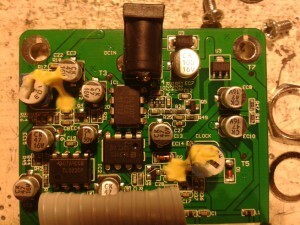 Switch is standard 3PDT mini stomper wired as true bypass. 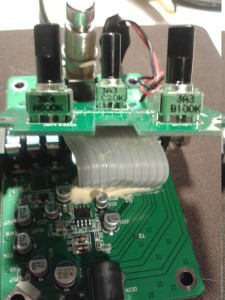 There’s the same goo locking the 6mm top adjustment trimmers and the top board ribbon cable connection. 3102/3207 pair is responsible for the chorus delay and TL072 is used for LFO. 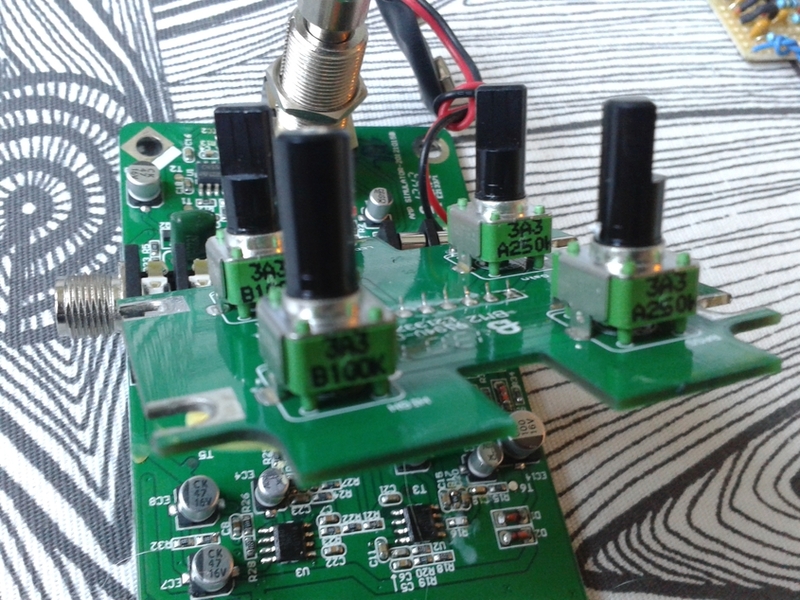 So it’s safe to say that the design is so far pretty standard analog delay chorus. The third knob, blend, adds a nice flavour. You can dial this to the max which by itself sound “out there”, but then you can blend it with the clean signal. More uses for ugly chorus sounds! Yay. There’s again just one piece of bad news. I seem to be repeating myself, but i would have gladly paid 50 cents (or $1-2 even) more for these Nux units – if they just would have better quality pots. The pots just feel cheap and turn too easily. Bad decision to save money. Because of the poor feel on the pots, i suspect these units will never get the attention nor userbase that they would deserve. From electronical point of view i mean. Nice. Extra nice. From clear and mild signal widening to near flanger styled massive sweeping. Wide control range and you just can’t go wrong with 3102/3207 based choruses. Or you can, but not with this thing. Entries (RSS) and Comments (RSS). 36 queries in 0.123 seconds.